Named after the shape they assume, hammer toes can affect the second to fourth toes on either or both feet.The joint bends, causing a deformity of the toe, and is often accompanied by corns, calluses or other blemishes on the skin. Along with the affected toe becoming misshapen, hammer toes can cause pain for the sufferer as the joint may rub on the shoe, pressure can build up in the ball of the foot and other toes, and hard skin may become noticeable on the foot. The most common cause of hammer toes is due to ill-fitting shoes that are too small and cause the toes to curl up to fit the footwear. Shoes that are too narrow at the toe can also cause the toes to flex into an unnatural position and cause friction to occur on the material of the shoe leading to sores and calluses to develop. Heeled shoes can also play a role in the progression of hammer toes as the cause pressure to build up in the toes and can push the foot forward leading to cramping in the toe area of the shoe. Other reasons may be muscle related as the muscles surrounding these toes act as ‘straighteners’ to the digit. If the muscle becomes damaged, their function may be compromised and the toe does not straighten as normal.Bunions, flat feet and arthritis all can play a role in the development of toe abnormalities, and these conditions will need treating alongside the deformity to prevent them from recurring. The most simple way of preventing hammer toes occurring is to always ensure there is sufficient room in the shoe for the toes to assume their natural position. During the summer, sandals are ideal as they allow plenty of room for the feet to spread and be comfortable.The wearing of heels should be kept to a minimum to allow for pressure to be relieved and for toes to have time to relax and spread out. If you feel you are developing hammer toes, please do seek advice from a reputable footwear retailer who will be able to measure your feet and select shoes that will help to prevent this condition from deteriorating. Your doctor will be able to advise you on the most appropriate form of treatment. This may include the use of cushions and pads to protect the protruding joint or to help relieve discomfort from corns and calluses. A suitable exercise programme can be useful in helping to strengthen any muscular problems that have led to the formation of hammer toes. The muscles surrounding the toes and immediate area may benefit from being regularly stretched and mobilised to try and encourage the normal position of the toe. Surgery may be an option in extreme circumstances, and can be performed under local anaesthetic. It will normally involve the surgeon reshaping the joint using carefully selected incisions in the muscle allowing for the joint to straighten. 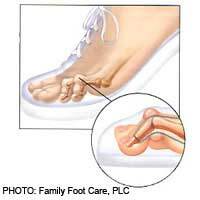 Hammer toes is a non-serious but very irritating and painful condition that affects many people. Comfortable and sensible consideration of footwear is the best way of treating and preventing hammer toes from worsening.